Shi'ites commemorate the killing of Imam Hussein, grandson of the Prophet Mohammed :saw, by his rival over 1,400 years ago. During Muharram, they weep and grieve in the love of Imam Hussein (AS) (grandson of Prophet Mohammed :saw) for his greatest sacrifice to save Islam and mankind, who was martyred along with his family and friends without having been given a single drop of water and food for 3-days by the man made caliph, Yazid ibne Mawiya. Shi'ite males (to their credit, they don't allow girls and women to hurt themselves) mourn Imam Hussein by slashing their heads with razor blades, knives and swords, beating themselves with chains, etc. People take their children to hairdresser who ritually slashes the child's forehead with a razor, and after the blood is spread by hitting the wound. Injuring oneself or one's children has no sanction in Islam and is not endorsed by Islamic scholars. 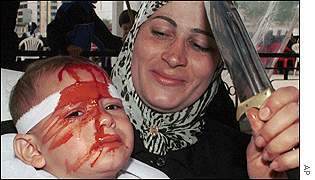 Some Shi'ites tried to convince me these pictures of parents helping their children injure themselves are fabrications. The truth is, this kind of thing has been practiced for thousands of years, before the martyrdom of Imam Hussein (AS) and even before the birth and prohethood of Mohammed :saw. It is an ancient pagan practice Shi'ites merely incorporated into their sect. This Lebanese boy's head is about to be cut to allow blood to flow. Barbers sometimes make the cut in children. The knife this mother is holding was not used, but is symbolic. Ashura is the tenth day of the month of Muharram. Fasting is advocated in the month of Muharram. The Prophet :saw is believed to have said: The best fasts after the fasts of Ramadan are those of the month of Muharram.. In the month of Muharram many centuries ago, (approximately October 20th 680 A.D.), an event took place in Iraq at a place known as Kerbala on the bank of the river Euphrates. A large army, which had been mobilised by the Umayyad regime, besieged a group of persons numbering less than a hundred and put them under pressure to pay allegiance to the Caliph of the time and submit to his authority. The Caliph was a man much taken with earthly pleasures that deviated from the Islamic way of life. The small group resisted and a severe battle took place in which they were all killed. The leader of the small band of men who were martyred in Kerbala was none other than Imam Hussein (AS), the grandson of the Holy Prophet :saw. Imam Hussein’s martyrdom at Kerbala represents a conscious confrontation with anti-Islamic forces and a courageous resistance for a sacred cause. The tragedy was that the one who stood up to defend Islam was cut down in so cruel a manner. It is for this reason that the death of Imam Hussein (AS) is mourned annually in the Muslim world. On Ashura, the Muslims take out processions carrying colourfully decorated taziyas (bamboo and paper replicas of the martyr’s tomb) embellished with gilt and mica. Colourful replicas of Imam Hussein’s tomb at Kerbala are also carried in procession and buried at an imitation Karbala. The mourners walk barefoot to the beat of drums. In a frenzy of grief, they beat their chests and cry out the name of Hussein. They sometimes even flagellate or whip themselves, drawing blood. Wrestlers and dancers enact scenes depicting the battle at Kerbala. While many Muslims take to the streets to mourn, there are some families that retain personal mourning houses. Lucknow (Uttar Pradesh, India), being the centre of Shia culture and religious activities, observes the rites of mourning with great passion. In places other than Lucknow, the taziyas are taken out and buried in the local burial ground known as Karbala. Sunni Muslims may also commemorate Hussein's death but in a less demonstrative manner, concentrating instead on the redemptive aspect of his martyrdom. Of course Shii'ites are not alone in blood-letting, self flagellation and ritual abuse practices in the name of faith. Ritual sacrifice was sometimes practiced in Viking times. There is enough evidence that we can say that the ancient Celts did practice and perform some form of human sacrifice. There is a great deal of evidence that these sacrifices were both voluntary and involuntary in nature and that the sacrificed were intermediaries that took the petitions of their people directly before the Gods of their clan. Looks barbaric. I've seen East Indians with a similar practice but it's self-inflicted. This is self-inflicted too, except in the case of small boys where a parent or barber cuts their head. The children beat themselves on the head to spread the blood and whip small chains across their backs. Not all Shi'ites do this. It is illegal in most countries and I think it is discouraged in Iran.